Nova DPNs are extremely light and slick needles, made from electroplated hollow brass pipes, with optimally sharp tips. 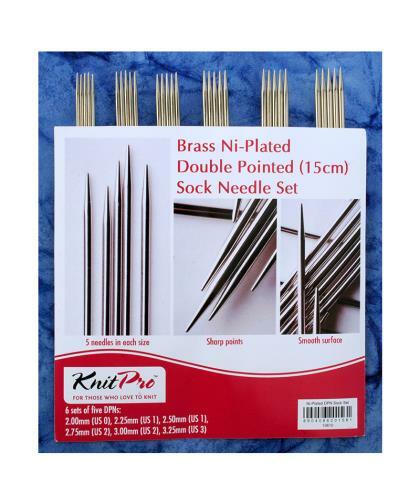 These magnificent needles with a satiny smooth finish and shiny surface allow effortless sliding of stitches and guarantee an excellent knitting experience. Double pointed needles are straight needles with tapered tips on both sides. DPNs are used in sets of four or five to knit small tubular projects such as socks, the tops of hats, even the fingers of gloves. Three or four needles are arranged in a closed triangle or square, and stitches are uniformly distributed among these needles, the spare needle is then used to knit stitches on one needle at a time while the other needles hold the stitches. DPNs are the preferred needles among many knitters for all their tubular projects. The double pointed needles can be used for creating tubes of as little as 4 - 6 stitches. Nova DPN set contains six sizes of needles ( 2.00mm, 2.25mm, 2.50mm, 2.75mm, 3.00mm, 3.25mm) in sets of five needles, packed in a clear vinyl case.